In the last 20 years, major changes in music practices have been moulded around new “affordances” coming from digital technologies and infrastructures, such as the mp3 format, peer-to-peer networks and streaming platforms. The social and economic life of today’s music can largely be considered as the consequence of ideas, visions and scripts embodied into those digital infrastructures, which reflect distinctive modes of music circulation and consumption. For this reason, it is interesting to consider the emergence of the so-called blockchain technology in the context of the music industry and, most specifically, its expected impacts on the circulation of recorded music. The application of blockchain – a cryptographic decentralised technology at the core of the increasingly debated Bitcoin phenomenon – in music has started to be anticipated not earlier than in 2015 and, at the beginning of 2018, this technology has yet to become an actual solution for digital music circulation. 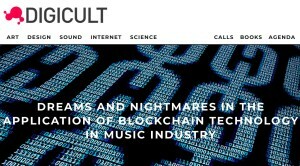 However, blockchain is today increasingly addressed by journalists, start-ups and research reports as the upcoming “revolution” in music industry and is often acclaimed as a new “disruptive technology” able to change the game in the music business and especially in artists’ chances to regain control over their musical works, in a music environment increasingly dominated by large digital corporations.